Dr. Karlyn Barilovits has been with Walden University since 2010. She has played an instrumental role in building the MSIS, MSIT, and DIT programs. Dr. Barilovits previously held the role of Associate Dean for the School of Information Systems and Technology. Dr. Barilovits holds a PhD from the University of Tennessee in Computer Science. She has experience as a programmer with NASA’s Jet Propulsion Laboratory and 25 years of experience in leadership and teaching in higher education. 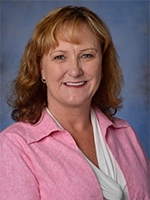 Dr. Barilovits currently serves as the Dean for the College of Management and Technology. Dr. Barilovits resides in North Carolina with her husband, 3 children, and 3 dogs. Barilovits, K. A., DePriest, D. (2011). LIVE: Xbox Kinect©s Virtual Realities to Learning Games. Barilovits, K. A., DePriest, D. (2009). Online Academic Internship. Barilovits, K. A., McKeeby, J. W. (2008). Synchronous Course Component Increases Student Success. Barilovits, K. A. (2008). Applying the HedgeHog Principle to Online Higher Education.